This is very much a local Crossmaglen song, with many places in the locality mentioned. It is not clear what the song is about. The term ‘cailleach’ or hag can refer to wise women, nuns or older women. There are two local placenames which refer to the hag: the townland of Carricknagalliagh: Carraig na gCailleach: the rock of the hags and the cairn on top of Slieve Gullion which is known as the cairn of the Cailleach Bhéarra: the Hag of Béarra – a reference to the goddess as hag. The term ‘cailleach’ also once referred to the harvest custom of cutting the last standing stalk of corn which and woven into a three stranded plait called a ’cailleach’ – symbolising the infertile winter goddess. It was hung in the house in autumn and kept there until spring. A celebration of feasting and dancing would follow, called the Calliagh’s feast. There could be a connection here between the ‘cailleach’ calendar customs and the ‘cailleach’ of this song, as the night before Halloween is mentioned and so too is fire. Halloween was a key event in the calendar year. The reference to gathering fuel to brighten ‘the dandy cap’ is a reference to needing a good fire to boil the water to bleach the cap. An Tighearna (The Lord) referred to a man called McMaster who lived in Creag a’ Chuilinn (Foxfield) in Clonalig. An Casadh Cam (The Crooked Bend) is part of the road at Clonalig. An Feadarnach (Federnagh) is an undefined district including the townland of An Cúirt Bán, (Courtbane) and parts of An Rasán Mór (Rassan) and Cluan an Liog (Clonalig).It borders on the three counties of Monaghan Armagh and Louth. The highest point in the Fews, Co Armagh is Carraig a’ tSeabhaic (Carrickatuke) where calendar customs are still held at Lúnasa. The version heard in the above video was learned from the Séamus Ennis transcribed manuscript from a wax cylinder recording made by Luke Donnellan c.1900 in Crossmaglen County Armagh, entitled An Chailleach Riabhach. It was reconnected to the lyrics published by Lorcán Ó Muirí in Amhráin Chúige Uladh by the singer Pádraigín Ní Uallacháin, and is in again being assimilated back into the local tradition. 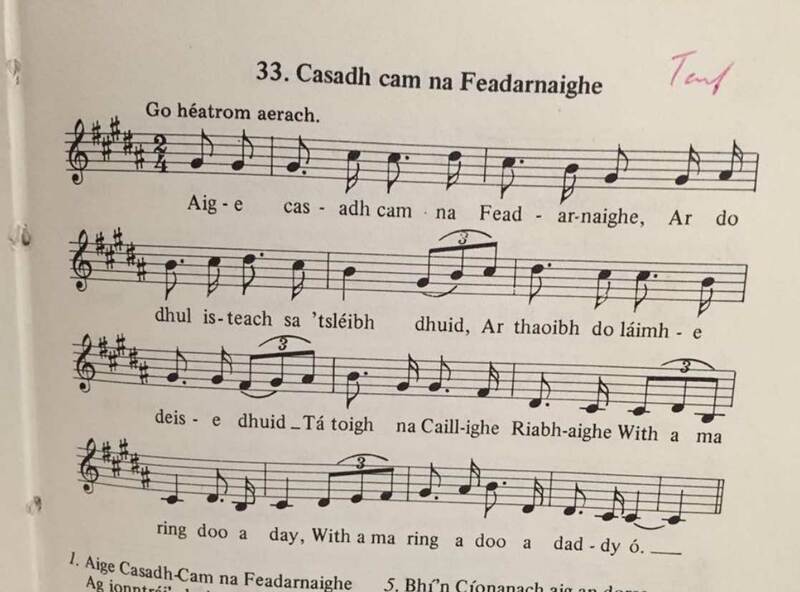 ‘Casadh Cam na Feadarnaighe’, Amhráin Chúige Uladh, from Mary Harvessy, Crossmaglen pp.54-55, ACU 1937. ‘Aige Casadh Cam’ from Séamus Ó Cruadhlaoich, the Poorhouse Carrickmacross, collected by Éamonn Ó Tuathail, Amhráin Chúige Uladh 1937 p.56. ‘An Cailleach Riabhach, Seán Ó hAnnáin mss.,Ó Fiaich Library Armagh from Brigid Mc Keown Clarnagh/Loughross. Ar thaobh do láimhe deise duit bhí tigh na Caillí Riabhaí. Bheinnse gá do dhallrúcháin ar thigh na Caillí Riabhaí. ’Sé Velvet bocht a d’arsódh duit cá mbíonn a’ Chailleach Riabhach. Is ’e réir mar déarfeadh na dailtíní ba í cumhartha Charn tSiail í.
Bhí Neansaí Gabha is na gasúir aige creach na Caillí Riabhaí. ’Sé chloisim aige na dailtíní go raibh cumhartha Charn tSiail ann. Is bhí níon na Caillí Riabhaí agus a máthair ag iarraidh déirce. Ag cruinniú ábhar tine le haghaidh a dandy cap a ghrianú. Ach Carraig a’ tSeabhaic na ndosán – sin brosna na Caillí Riabhaí. In towards your right hand was the house of the brindled hag. I’d be there adazzling you in the house of the brindled hag. It’s poor Velvet who’d relate to you where the brindled hag is. And according to the workers she was the fragrance of Carnteel. Blacksmith’s Nancy and the lads were at the wrecking of the brindled hag. And there, the workers tell me, was the fragrance of Carnteel. The daughter of the brindled hag and her mother were a-begging. Gathering fuel for his ﬁre to brighten up his dandy cap. But Carrickatuke of the bushes – that’s the brindled hag’s kindling. This song was popularised to a different air. During research for A Hidden Ulster – people, songs and traditions of Oriel, this air was discovered entitled An Chailleach Riabhach, which was also collected in Crossmaglen – probably from the Hearty/McKeown family of singers (AHU pp.392-3) in Loughross, by collector Luke Donnellan (AHU pp. 361-3). He also made a recording which was transcribed by Séamus Ennis (AHU pp. 368-70). The refrain melody is a repeat of the two long melodic lines of each verse. The air is like a variant of a local song Dúlamán, classed as a ‘Scottish tune’ by a local collector. It was recorded on the above video in An Mullach Bán, June 2016. Luke Donnellan Box II p.25 No.2 – no words. There more popular air sung to the lyrics above, were collected by Lorcán Ó Muirí (AHU pp. 358-60) from Mrs Mary Harvessy (AHU pp. 391-2), and written down for him by Fanny Kane (AHU pp. 367-8) who was musically literate. He published it in tonic solfa entitled Casadh Cam na Feadarnaighe in this 1937 collection of Amhráin Chúige Uladh, later edited and published in staff in 1977 by Colm Ó Baoill (below). It was a favourite of the collector Ó Muirí who sang it and brought it to Rannafast County Donegal. It was then assimilated into the Donegal tradition. That popular version was recorded by Pádraigín Ní Uallacháin on A Stór is A Stóirín Gael Linn CD 1994. That air is know to an English language song as A Ballynure Ballad and in the Connemara tradition as Máire Mhór.